Wireframing is an essential part of the web design process in 2009, but it’s an area where no one tool has yet come to dominate. Talking to other front-end people, there seems to be three basic schools of thought. Many of us stick with the tools we already know best — Fireworks, Illustrator, and Photoshop. No argument that these are good options as they’re cheap and draw on the software skills you’ve taken years to hone. Then there are those who hand draw their beautiful wireframes, often referred to in the industry as show-offs. If you’re a dab hand with pen and paper, this is a nice way to impress both clients and that special someone. Finally, there are the information architects and UX designers, who often prefer specialized wireframing tools like iRise and Axure. These tools generally set loftier goals, aiming to produce full working prototypes rather than just static, linked graphics. While they’re unquestionably powerful and rich working environments, they come with a learning curve and a price tag that will deter some. 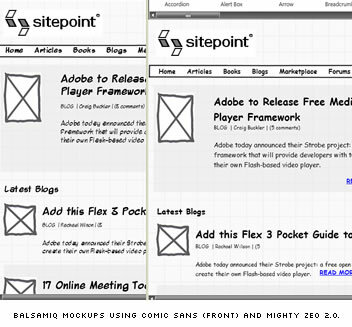 Today I’m going to look at a specialized yet relatively simple and inexpensive wireframing tool: Balsamiq Mockups. Firstly, let’s deal with some of the basic need-to-knows. 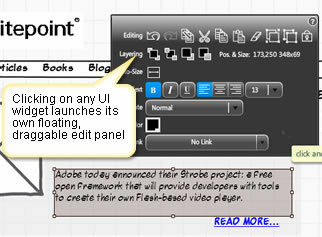 Balsamiq Mockups is another in the burgeoning category of Adobe Air applications. The nice part about this is it means the live demo you play with on the site is virtually the same as the application you download and run on your desktop. By extension, this also makes Balsamiq automatically cross-platform. Application Bar: This give you the standard range of cut, paste, and copy controls. UI (User Interface) Library: This is a drag and drop collection of common interface widgets. Mockup Canvas: This is your working space. Building a wireframe with Balsamiq Mockup is as simple as dragging UI widgets from the gallery onto your canvas. Each element remains permanently movable, editable, and resizable. I found this covered the vast majority of day-to-day needs although sometimes I did find myself wishing for a simple pen tool to add basic lines and shapes. Once dropped onto your layout, clicking on any UI widget automatically launches its own floating edit panel (shown above) that allows you to change the properties of that element (bold, italics, sizing, alignment, and so on). Double-clicking on the element allows you to edit its content directly. This is easy to imagine with simple text fields but is more impressive with greater complex widgets such as tabs, menus, and tables. Adding new menu items is as simple as adding a new value to a CSV list. Okay, but you’re thinking: what if I need some non-standard/weird element/widget that’s NOT in the library? Happily, the built-in image widget gives us an option. 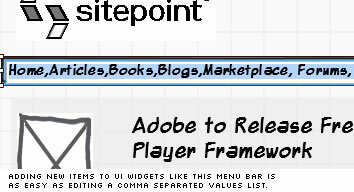 By default, the image widget gives you a square placeholder graphic (as above) but you’re free to load any third-party image into these placeholders — as the SitePoint logo above shows. In fact, there’s even an option to automatically convert your image to grayscale. This ability to effectively create and load your own widgets means you’re able to wireframe virtually any layout with this tool. Now, if you’ve looked at any of the screenshots so far, you’ll have no doubt noticed that Balsamiq Mockups has a certain look about it — a loose, hand drawn, sketchy feel. To some this will be its great charm; to others, its major drawback. There’s a good argument that presenting loose, sketchy wireframes is helpful to allow your clients to focus on the structures and general layout goals, rather than being caught up in more transient design detail. The sketchiness communicates this isn’t final. Of course, the counter-argument is that Balsamiq’s sketchy quality becomes a dominant style of its own that attracts the client’s attention away from the task at hand — the exact opposite of its intention. Personally, I can think of different clients where either of these two scenarios could easily apply. In a perfect world, I think you’d be able to strip away the sketchy line style in the same way that you can remove a brush stroke in Adobe Illustrator. At the moment that isn’t an option. Although Balsamiq won’t suit all situations and designers (Andy Budd is no huge fan), I think there’s certainly a viable market for the product. a little more visually compelling than a typical dry, black-and-white, "boxes and lines" wireframe. I could see myself using the sketchy style for plenty of situations. But what do you do in situations where you feel this styling might be read as slightly cartoony? There’s no obvious alternative. On the up side, Balsamic Mockups is inexpensive and easy to learn, so if you’re still to be convinced you need a standalone wireframer yet, this is an opportunity to dip your toe into the wireframing water without making a huge investment. Web Development Clients: While I wouldn’t give this to all clients as a matter of course, there have been many ongoing clients I’ve worked with that would have loved using this tool to communicate their broader ideas. Managers and Online Marketers: Interestingly, Mark Harbottle (SitePoint founder) overheard me demo-ing this to a colleague and immediately saw it as a tool to lay out his big picture ideas for remodelling parts of the site. Currently, Mark uses MS Word for this task, so Balsamiq is a huge improvement. Finally, if you’re thinking about wireframing tools in general, you might want to check out Gary Barber’s recent article outlining 16 alternatives (including Balsamiq): 16 Design Tools for Prototyping and Wireframing. If there’s one belief that unites designers of all ages, genders, and creeds it’s a burning hatred of one font — the reviled Microsoft Comic Sans. Unfortunately, Balsamiq’s designer was unaware of this quirk when he chose it as the application’s default font. What’s more, there’s currently no easy way to change this setting. Firstly, source a suitable Comic Sans replacement. Luckily, just last week Jennifer Farley wrote a great blog post on where to find nice alternatives. I’ve chosen Blambot’s Mighty Zeo 2 for this example. Change the <fontFace> value to the name of your preferred font. This might require a little trial and error to find a font with the right feel, but most will believe it’s worth the effort. Hopefully, later releases will make this process a little more elegant.